Group of students attending the 19th annual Accounting Challenge. 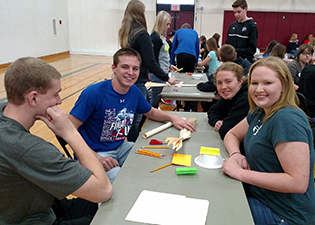 CARBONDALE, Ill. -- More than 200 students from 21 high schools and community colleges competed in Southern Illinois University Carbondale’s 19th annual Accounting Challenge on Feb. 24, vying for college scholarships and other prizes. The event, sponsored by the College of Business’ School of Accountancy, began with written quizzes assessing the contestants’ accounting knowledge and skills. Competitors earning the highest scores in each division won certificates and scholarships worth up to $500 if they attend SIU and major in accounting. Third – tie, Shane Atkinson, Hamilton County Senior High School, 12th grade; Jacob Maschhoff, Nashville Community High School, 10th grade; Drew Kuhl, Nashville Community High School, 11th grade; $200. Then, teams tested their mettle with a unique challenge. Each group received a couple of folders, a strip of tape, paper clips, a bowl, a few Popsicle sticks and a pair of scissors. Their goal was to build a cantilever to extend from a platform attached at the top of a ladder. They were to attach the bowl at the end of the cantilever. Teams received points based on how many inches the cantilever extended. The competition was intense and they could multiply that score by the number of golf balls that they placed in the bowl. At any time, they could stop adding balls. If any balls fell out of the bowl, they lost the multiplier and received only the score for the length of their cantilever. Their scores for this challenge comprised 70 percent of the scoring for the team challenge while the average of the scores team members earned on the individual testing counted for 30 percent of their total scoring. Each winning team received a trophy along with individual trophies for team members. Camille Hammers, a senior accounting major from Murphysboro, was the coordinator of the 2016 Accounting Challenge.